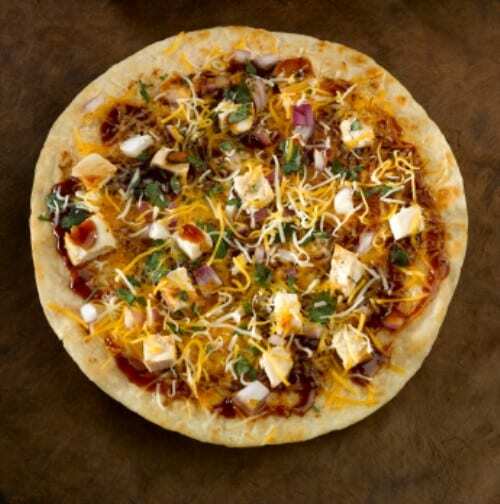 Home » Appetizers » California Pizza Kitchen Original BBQ Pizza – you can make this special dish at home, our version of the recipe is no secret. 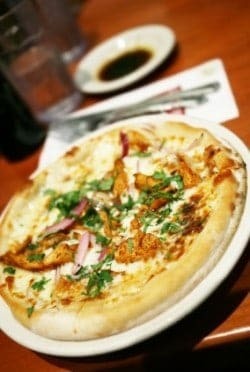 California Pizza Kitchen was one of the first places to make really unique pizzas. This pizza features chicken, cilantro, and Barbeque sauce. The California Pizza Kitchen has two great cookbooks. The California Pizza Kitchen Cookbook. You can make this special dish at home, our version of the recipe is no secret. 2 tablespoons barbecue sauce (we use a spicy-sweet sauce). 1/2 cup barbecue sauce (we use a spicy-sweet sauce). In a large frying pan, cook the chicken in olive oil over medium-high heat until just cooked, 5 to 6 minutes. Do not overcook. Set aside in the refrigerator until chilled through. Once chilled, coat the chicken with two tablespoons BBQ sauce; set aside in the refrigerator. To make the pizza Place a pizza stone in the center of the oven and preheat to 500 degrees for one hour before cooking pizzas. Use a large spoon to spread 1/4 cup BBQ sauce evenly over the surface of the prepared dough within the rim. Sprinkle 1 tablespoon smoked Gouda cheese over the sauce. Cover with 3/4 cup shredded mozzarella. Distribute half the chicken pieces evenly over the cheese (approximately 18 pieces). Place approximately 18 to 20 pieces of red onion over the surface. Sprinkle an additional 1/4 cup mozzarella over the top of the pizza. Great recipe.Pizza is something I’ve never really tried out on my own but I hope to try this recipe soon. Thanks for sharing. This BBQ pizza is out of this world! Love this and I will be making this again!